One of the most annoying things about Adobe Reader is that it is in need for constant updating to newer version due to security issues. While this is true for most software packages whenever you install an Adobe Reader update it also restores the desktop icon even if it has already been deleted. (Annoying!!!). So below I go through how to use one of the new Group Policy Preferences options is called “Shortcuts” to remove the icon when ever it is re-instated (see below). 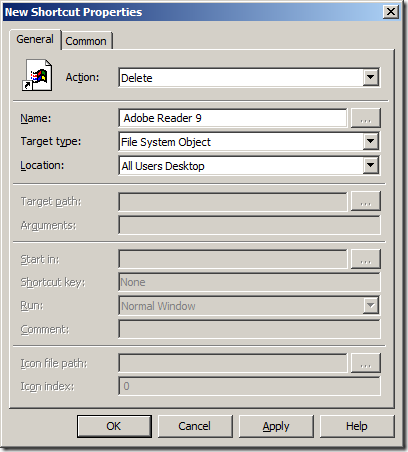 While in this example I use (pick on) Adobe Reader it can also be used as a guide for removing any other shortcut that you so desire. Now wait time you install an Adobe Reader update all you have to do is wait for the next group policy refresh and the shortcut will be gone… (Yes). ← Group Policy Team Blog : Visual C# Samples Using the GPMC Class Library Published! 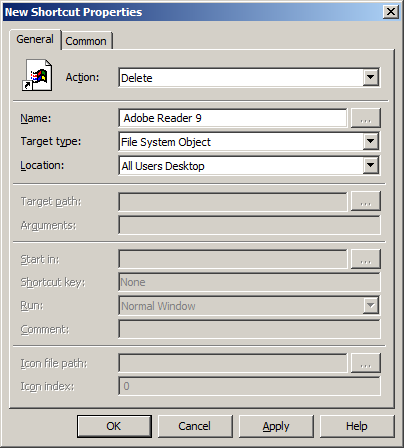 I like this tip, but not for Adobe Reader. I much prefer using the Adobe Customization Wizard to create a custom transform .MST for Adobe Reader’s .MSI package and then deploying it via GPO Software Installation. With the custom transform you can not only remove the desktop icon from ever being installed, but also accept the EULA, remove menu items, disable checking for updates, etc. I’ve used the customization wizard and it works great until Adobe does a update and replaces the shortcut, even though in your install you told it not to create one.